Step 1 Cut the ends from each zucchini, slice the zucchini in quarters lengthwise and then cut the quarters in half crosswise. You'll have large pieces of zucchini about 2 to 3 inches long. Step 2 In a heavy-bottomed skillet, warm the olive oil and the onion over medium-low heat until the onion softens and becomes fragrant, 3 to 4 minutes. Add the zucchini, the garlic, lemon zest, 1 teaspoon salt, 1 teaspoon mint and 2 tablespoons of water and stir well to combine. Reduce heat to low and cover. Cook, stirring occasionally, until the zucchini is extremely tender and almost translucent, about 25 minutes. There should be some liquid still in the bottom of the pan. Step 3Remove the lid, add the lemon juice and increase heat to high. When the liquid begins to bubble, remove from heat and set aside uncovered. When the zucchini is at warm room temperature, stir in the remaining 2 teaspoons mint and the pine nuts, then taste and add more salt and lemon juice if necessary. Serve warm or at room temperature. In Recipes-list.com we have selected the most viewed recipes from category - Best recipes Healthy eating Vegetables Vegetarian . Enjoy the best recipes specially selected for you! 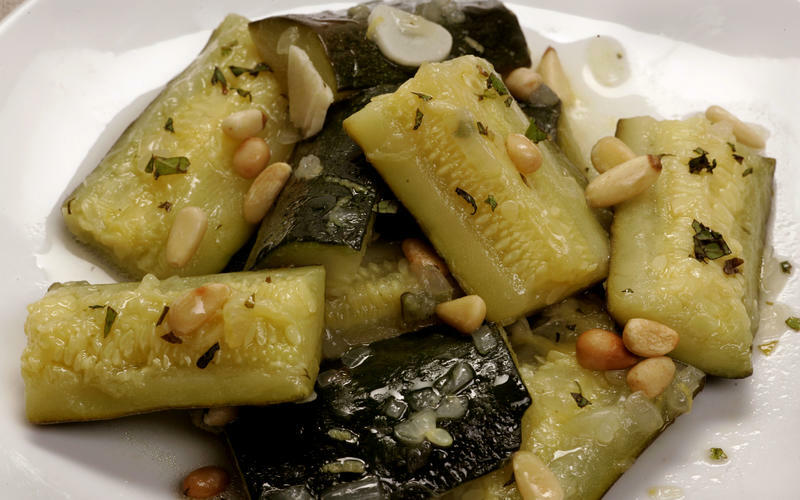 Braised zucchini with mint and lemon is the right choice that will satisfy all your claims.